This entry was posted on Wednesday, April 14th, 2010 at 9:54 am and is filed under Travel & Landscapes. You can follow any responses to this entry through the RSS 2.0 feed. You can leave a response, or trackback from your own site. Love the ballon shot, definately looks like a few of them are about to ditch in the lake, did they make it back up into the air again? Hey Dave, How’s it going? Yup they all made it back out of the water although a few did look like they were struggling for a while. Thankfully these were private balloons, they tend not to play this game in the big baskets with paying customers on board! Great shot Sandy, dont think you could get a better compostion than that! Thanks Matt, it was pretty easy with so many flying overhead. 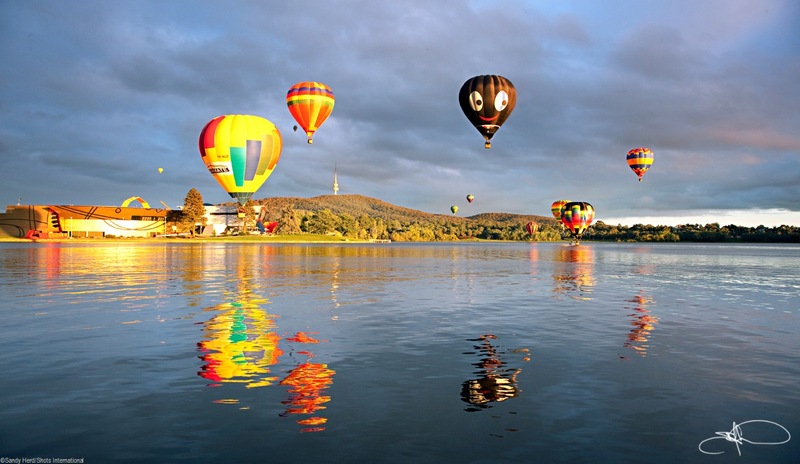 Always good to see a nice ballooning photo Sandy, I would love to visit this event one day. I have heard it’s pretty cool. It was good fun…there was a huge Kookaburra balloon went up that same morning and he was lovely! I have jumped out of a few of those puppies! How high do they have to be before it’s safe to jump? Yep with a parachute and the lowest that I would get off a ballon would be about 1500 ft, but I am sure there are those how would take that to another level of crazy! I have done about 5 ballon jumps from heights ranging from 2,000 ft to 5,000. They are waycool fun as there is no airspeed at all and you really get the sensation of falling until you reach terminal velocity! I’m not a huge fan of flying and I’m not really fond of heights either but I have to say I did enjoy being up in a hot air balloon, it was pretty serene. Don’t think I could jump out of one though…especially from 5000ft. I try to avoid anything that involes the term “terminal velocity” !! Yep ballooning is great fun just drifting along and watching and listening. If they could work out a way to make the burners super quite it would be even better.